This month I'm going to give you a photography challenge that is a little bit more involved, but the rewards will be well worth doing it. I'm talking about doing a day in the life documentary style photography project. About three weeks ago I had to say goodbye to my grandmother who was 96, we always just called her Grammy. She fell and broke her hip and pelvis and it was too much to recover from at her age and level of frailty. I knew the day would come but I dreaded it none the less. Grammy circa 2013 from our day in the life photo shoot. One way that I was able to contribute to her legacy is by creating a book of the day in the life of Grammy. Last year I was able to deliver copies to all my family members, including the star herself. The photos gave us all much joy (she used to wrap her hair in toilet paper every night before bed and I captured that in photos and we all had a good laugh, herself included) and now we will have them to help us remember her with love. This challenge is a sort of memorial to her and to encourage you to create the same kind of memories and tribute to someone you hold near and dear to your heart. What is a day in the life project? 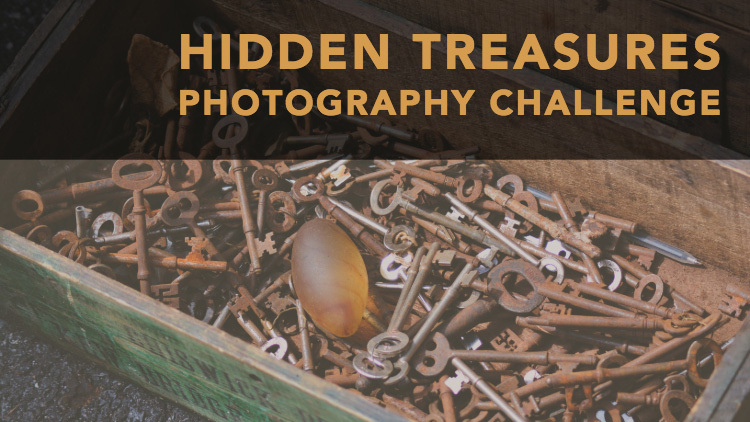 As the name indicates, for this challenge you will photograph someone for a whole day. You'll follow them around for the day, photographing whatever they do. Of course you can set some things up, but for the most part, try and capture their day and their normal activities as they unfold naturally. Grammy sure loved watching her “soaps”. I've done day in the life projects with both my niece and nephew when they were each 3 years old. Some of the activities I captured included a trip to the playground, playing with the cat, hop-scotch, colouring and crafts, a nap with the cat on the couch hiding under a blanket, a water fight with the neighbour kids, and a refreshing jump in the blow-up pool to cool off on a hot summer day. Kids are great subjects for this project as they typically have two modes – on and off. They're full of joy and have infinite ideas of what they want to do next. Sorry I cannot share those photos with you here as I must respect their parent's wishes to keep their photos off the internet. As mentioned above, kids are great for this kind of project. You'll never run out of things to photograph. But what about the other end of the age spectrum? Think about your elderly family members, friends, or neighbors. It was Canadian Thanksgiving earlier this week and I'm super grateful to have been able to photograph both my husband's uncles and my Grammy in this manner – all of whom have now passed away, but not left our hearts. In 2010 at the end of a 6-month RV trip that took us over 17,000 miles (27,000 km) we stopped to see Rob's uncles, then well into their 80s. At that time they were still farming the old homestead in Saskatchewan where “The Uncles” and Rob's dad grew up. So I went about documenting their daily activities. I suggested a few things and did a few posed portraits, but mostly I just captured how the day unfolded naturally. When undertaking a project of this nature I recommend having a chat with your chosen subject (or the parents) ahead of time. Get some ideas of what to expect, check out the shooting locations, analyze the lighting, etc. Have a few plans and ideas you can work in if need be, and know what equipment and/or props you'll need to bring or prepare ahead of time. If it's dark (low natural light) you may need to bring a flash or use a lens with a large aperture (like a 35mm or 50mm f/1.8). Can you use a tripod at the shooting locations? Do you need a wide angle lens or a longer one? Do you want to do any posed portraits, if so do you need a reflector or other lighting? I used a wide-angle lens with a large aperture for the shots inside the old house. Mealtime – what do they eat and where? Playtime – even for adults, what do they do to relax? Getting ready – combing hair, brushing teeth, etc. Especially good for kids. Hobbies – do they like to garden, read, watch soap operas, play bingo, ride horses? Excursions – if they do errands go along. Just make sure if you are at any indoor locations that you get permission to do photography. Go for a walk in the park, or walk the dog. Details shots – make sure to get some close-ups of things that really show what the person is all about. Hands, clothing, feet, personal items, etc. Clothing – do they have a special article of clothing or jewelry that really identifies them? Photograph it! Uncle Neil taking us out to feed the cows. We learned that he'd spit into his right hand every single time right before he would shift the truck into gear. A funny little quirk we'd never have known about otherwise. He was 88 when this was taken and still did this every day. We worried about a cow stepping or rolling on him in the field but this was what he loved to do. The list above is not exhaustive and I'm sure you and your subject can come up with more ideas together. Get creative, think outside the box, really go deep and cover what they are all about. Try and show who they are as a person with your photos. Uncle Ward, 84, used instant coffee and sometimes would even just take a spoonful and eat it without water! Ward and his tractor (my husband does the toothpick thing too, must be a family trait). Neil loved his horses and they clearly loved him back. What to do with your day in the life photos? Earlier I mentioned that I made a book of Grammy's photos using Blurb, I did the same with the Uncles and my nephew (niece's book is in the editing stage). This is the best way to put together a day in the life project. You can also do a web gallery to share with others online but nothing compares to having it printed in book form and in your hands. 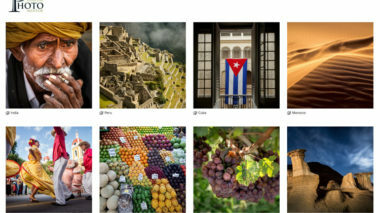 I use Lightroom, which is a great way to plan your photos (use a Collection), edit them, and do your book layout (in the Book Module). Hmm, perhaps an idea for a future tutorial – I will take note! Cover of the book I made for the uncles. Click the photo to preview the entire book. Remember those details shots I suggested that you take earlier? They work great as page backgrounds and scene setters. Here are some I shot on the uncle's farm. See how I used a shot of the farm scene as a background image here? Here I used a shot of the wall of the house as the page background. Just because you set up a shot or pose it doesn't mean it has to look posed. Here are some I took of the uncles. I set up the scene but let them interact within it, so it still seems natural. Looking through old family photo albums, we found a photo of my husband on the living room floor of this house. We looked over – and everything was still in exactly the same places! This shot was my husband's idea – to mimic the famous American Gothic painting. I think it's kind of humorous. The guys had no idea. Family photo – uncles and nephew. Can you see the family resemblance (the nose!)? Remember a few key points as you undertake your day in the life photography project. First, take your time and get your settings right. Make sure the images are in focus and have a fast enough shutter speed to make sure they are sharp and crisp. Make your setting choices based on necessity and artistic vision. Use a wide aperture to blur backgrounds, or a slow shutter speed to ad motion if it adds to the mood. Second, always look at the light. How does it fall on your subject? Is it flattering? Is it hard or soft light? Does it add to the mood or take away from it? Observe light always and shoot when it's at its best. Get the subject to move if need be, sometimes getting into the shade can make the difference to having a successful image or not. So we've talked about all the different kinds of shots to get on your day in the life photo shoot. When it comes to selecting the final images there's one more thing to take into account – that's storytelling. First, let me show you a selection of the images I chose for Grammy's book. Then I'll tell you about her and you can tell me if the images match the story. Keep in mind if you've chosen to make a book you can also add some text along with your images. I kept it minimal in her book just enough to caption the images. Those who know her well know the meaning and story that the images tell. Rest in peace – we love you! Grammy, as she was called by pretty much everyone in my generation and younger. Even if she was not their grandmother my friends, my cousin's friends, and pretty much any younger person called her Grammy. Of Polish/Ukranian descent she grew up in a small town in Alberta, Canada. Her father worked for the railroad as did her husband (Grampa) Victor (who predeceased her by 30 years). She was the most amazing woman I've ever met (okay there might be one more, her name is “Mom”) and she taught me a lot even though she wasn't book educated. When I was a child, she would come and get me from Edmonton (3 hours north of her) and we'd travel to Calgary by train. I would stay with her and grampa over part of the summer when I was about 5-8 years old and go to the Moose Lodge with them. They taught me how to play cribbage and shuffleboard and to enjoy friends and life. I remember watching her and “auntie” Audrey drink wine spritzers and giggle like teenagers. I loved those times when it was just me and them. It was special and I shared those memories with her on my last visit. Grammy always had something baking or cooking and pretty much insisted on feeding you the second you entered her home. There was no sense refusing, you'd end up with a cookie, perogies, or fresh tatty bread (an Irish flat potato bread fried with butter – yum) in the end. She was always feeding people, something my mother also got from her. I remember once Grammy was on a team of ladies that made dinner for 400 people including gravy (I would have no idea how to do that). She was gentle and kind and I do not ever remember her having a harsh word or mean thing to say about another human being – ever! Her motto which she always installed in us grandkids was to just love each other. She never understood war or fighting. “Why can't they all just get along?” she'd say. The world could use a little more of that now more than ever. I'm grateful to have had such a wise and loving matriarch in our family. I took this photo in NYC and took a print of this to her hospital room. Somehow I had the vision to see this on the street in New York and take this photo – because it is perfect to sum up everything Grammy was about. She called herself Angel Girl and always had an angel with her or on her somewhere as a pin, pendant or necklace. 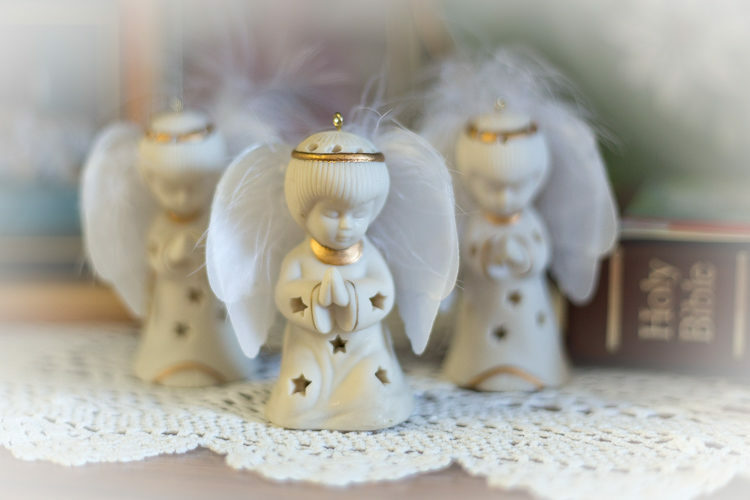 Her home was full of angels and photos of her family (3 daughters, 6 grandchildren, and 8 great-grandchildren as well as 8 siblings and numerous nieces and nephews to which she was Auntie Stella). We were her greatest accomplishments and her greatest joy. You can see all the photos on her walls (above photo watching TV) are all family pictures! Grammy loved to hear about my trips and the things I was doing. I tried to make it a habit to call her weekly, sadly that is one of my greatest regrets. I didn't always make that happen and it saddens my heart that I didn't get to talk to her after my last trip to NYC. 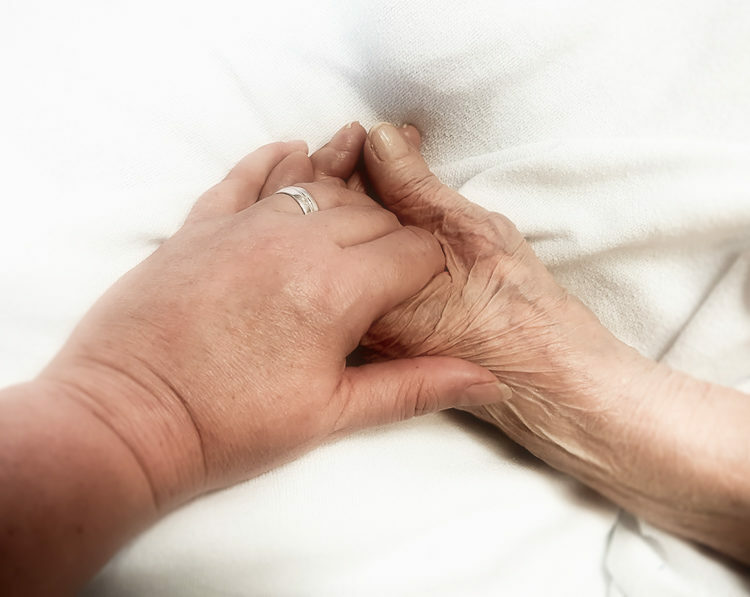 I said my final goodbye at the hospital but she was unable to respond by then and just squeezed my hand gently – so I knew she heard me and that I was there. 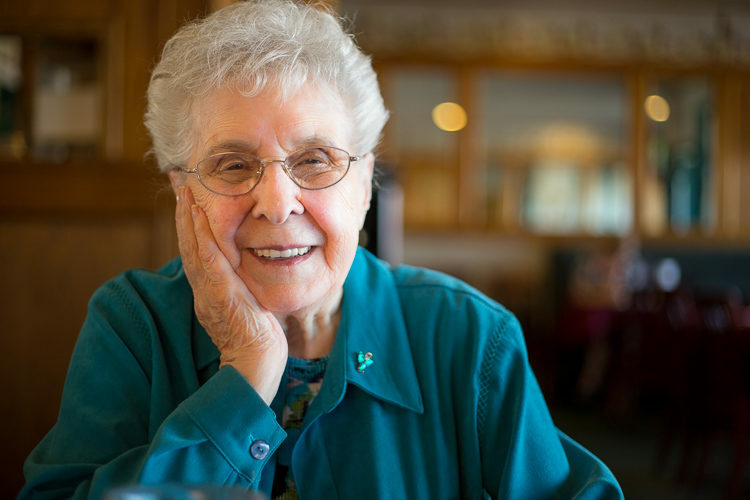 She saw many changes in technology in her lifetime of nearly 100 years. Sometimes on our calls, I'd ask her to tell me about her childhood and what it was like. She told me stories about her mother making bread for the railway workers and how she wanted the store made bread instead. Things like Facebook and Skype still baffled her, how I could fly half-way around the world and “talk” to people on the computer was beyond her. But she spoke to her daughters every night on the phone and her apartment walls were covered in photos of her family (us). From a trip in 2015 that my friend Christine actually suggested. 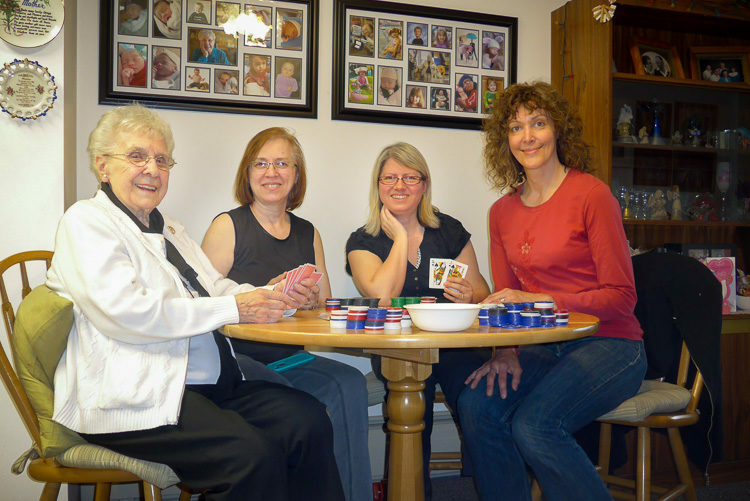 We drove down to Calgary to play poker with my aunt Joyce and Grammy. This is the last photo of her and me together – that is my biggest regret, that I didn't do one of the two of us in 2013 during my day in the life project. Don't forget to get in some of the photos with your loved one – especially if you are a big part of their life and day. Everyone loved Grammy, she touched many lives. All animals loved her, even grumpy old dogs that growled at everyone else would sit with their head on her lap so she could pat their head and they could take a nap together. This is a song she used to sing to all of us grandkids (and her great-grandkids) – this is a beautiful and haunting version, I think she would love it. Her husband, Vic, and her family were always her sunshine. Now she is with him to be young again and dance (which she loved oh so much). When the sun is shining, I know that Grammy is still my sunshine and is with me and will be always. Thank you for listening and reading my tribute to this amazing woman. She is greatly missed and the hole in my heart will be a long time in healing. But one of the bonuses of doing that day (or weekend) of photos is that I got to spend quality time with her. Doing the things she loved, having tea, playing cards, and just chatting as two women, (not grandmother/granddaughter). I will miss her laugh, her smile, her perogies, and her hugs. I'm eternally grateful for the time I spent with her to take the photo, and for the images, which I now have as memories. So now I urge you to do this challenge. There is no prize this month because doing it is your prize! If you do this I promise you will win, in so many ways. Use your day in the life project to create the same memories with someone special and close to you. My friend and fellow photographer Renee Robyn wrote something this week that goes right along with this topic. Read: Does Photography Matter? about her experience with her elderly cat. If you're an animal lover, have a tissue handy. 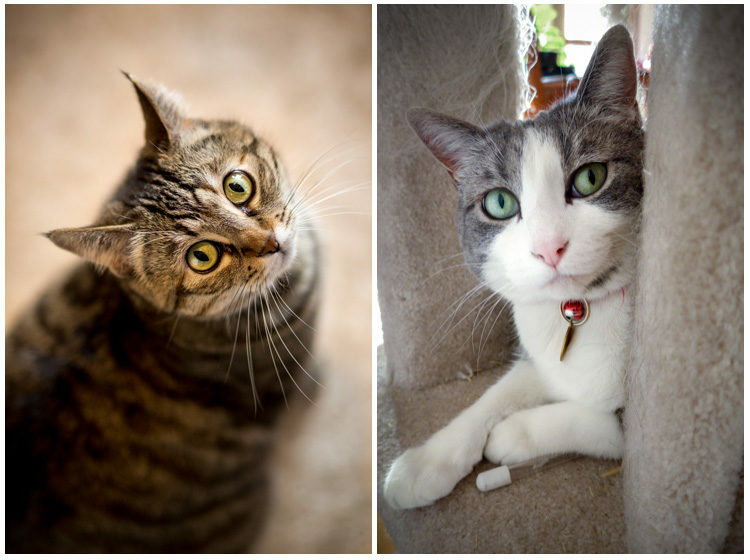 I wrote Photograph Your Loved Ones five years ago now when we lost our two beloved cats Pumpkin and Boo, and it's just as relevant now as it was then. Our current pets. Munch (short for Munchkin) on the left and Fuzz on the right. Don't wait until it's too late. Have no regrets. It doesn't matter if your photography isn't perfect. 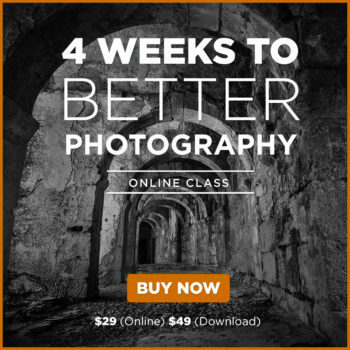 Just do it anyway – for you and the person you photograph. Please post some of your images in the comments section below if you want to share, I'd love to see them.